I was out yesterday and came home to the BDJ Box for March! Exciting. 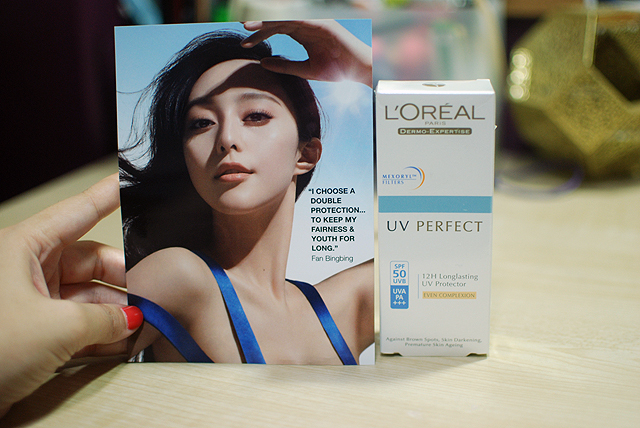 I wasn’t sent last month’s Shiseido bonanza, but BDJ Box has a lot of L’Oreal goodies this month that I’m sure a lot of subscribers would enjoy. OK, a head’s up: this month’s box is hefty. It was so heavy! I put two and two together and figured that they included full size hair products, and I was right! Here are full sizes of the Fall Repair Hair Shampoo (Php 110 for 180ml) and the Full Repair Hair Conditioner (Php 119 for 180ml), which are meant to nourish your hair and make them less fragile. I’m not too picky about hair products, and my hair “rejects” very few variants (the old Dove shampoo, par example), so these were OK things for me to get. Hair fall isn’t really a major problem for me. 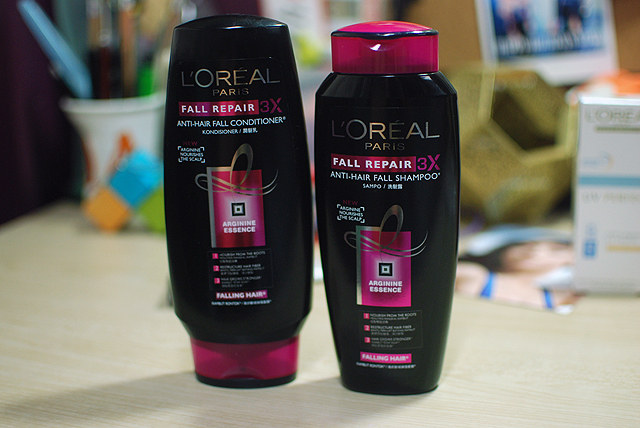 It was, but I fixed it with the red-capped L’Oreal shampoo. I’ve been using products from their new range—the Ever Strong shampoo and conditioner—which I love. It’s a fairly new release in Manila, too. If you want to see what it looks like, click here. 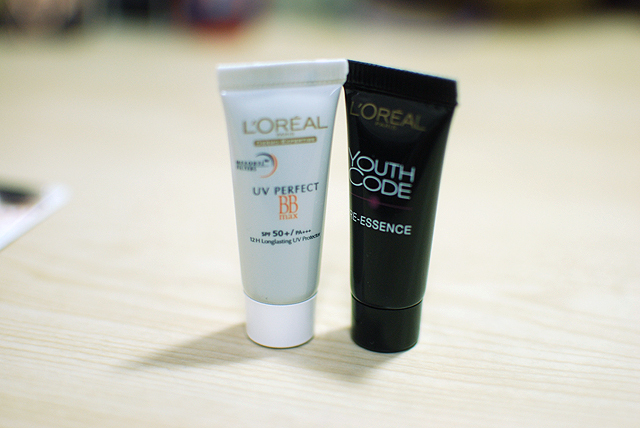 Here are two 5ml sample sizes for the UV Perfect BB Max (Php 595 for 30ml) and the Youth Code Prodigious Rejuvenating Pre-Essence (Php 1495 for 30ml). The 5ml samples cost Php 99.17 and Php 249.17 respectively. The UV Perfect BB Cream has SPF 50/PA+++, which is awesome, and claims to last 12H. It corrects discoloration and skin imperfections “instantly,” and freshens and brightens your complexion. The color is a little pinkish grey, but the product sinks into the skin fairly quickly. I was most excited to see this in the box! Here is a full-sized 30ml bottle of UV Perfect Longlasting UV Protector. It has SPF 50/PA+++ and lasts 12H as well. It is formulated for Asian women, “whose skin is always exposed to UV rays and other atmospheric pollution.” It is also tinted, with a focus on shades made for typical Asian skintones. 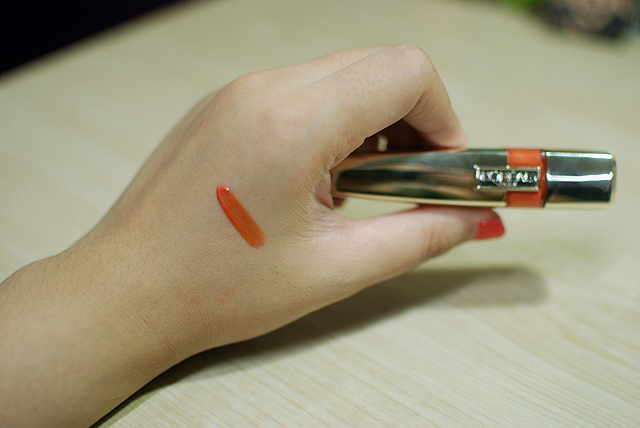 I got “Apricot,” which I thought to be too light, but the pigmentation is quite sheer so it blends into the skin easily. It fights against brown spots, skin darkening, and premature skin aging. UM, yes please! 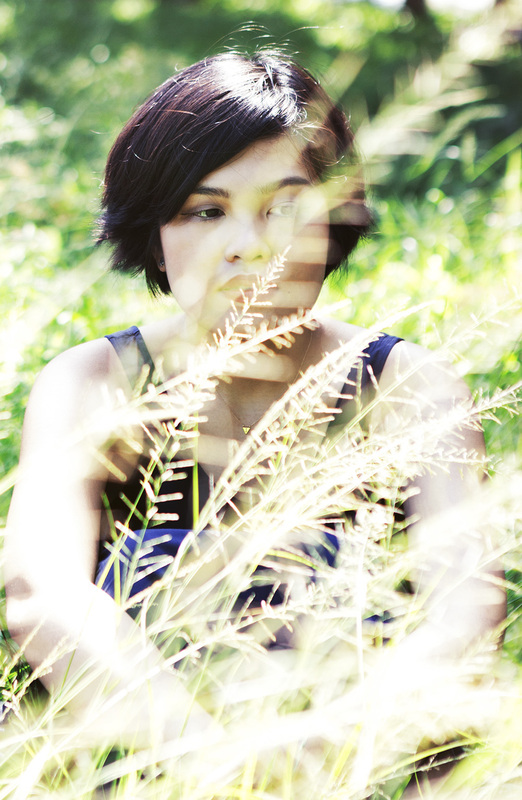 Included in the box is a Shine Caresse (Php 595 for 6ml) in 804 Faye. While I loved seeing a Shine Caresse in my BDJ Box, it’s unfortunately not a color I would pick out for myself, thought it is quite fit for summer. I just don’t think I can pull off orange very well. 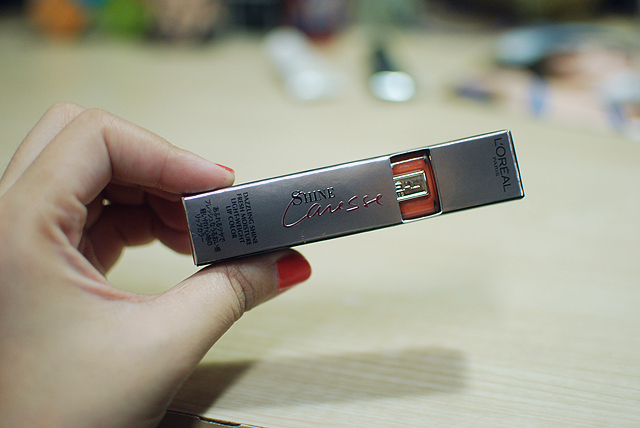 If you’re thinking of picking up a Shine Caresse, I have a sort of review comparison up here. It’s quite a close dupe to the YSL Glossy Stains, so if you want to see if you like the formulation before dropping $30 on a lip product, check the L’Oreal Shine Caresse first. An unfortunate angle for my hand. It kinda matches my nails, huh? 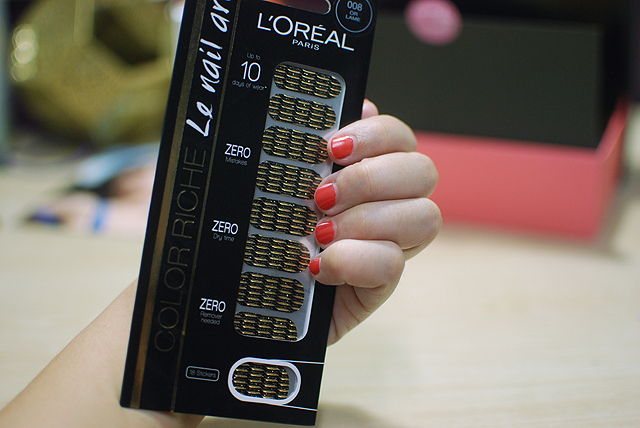 Last but not the least, here is the Color Riche Le Nail Art (Php 395) in 008 Or Lame. Right off the bat, I think you can see why this is fairly unusable to me. My nails are freaking tiny. These are good in theory, though. For how well they work, well, I don’t know. Nice to have if you’re into that kind of thing, of course. And, that’s it for the box! As far as I know, March boxes are all sold out, but you can sign up for a BDJ Box subscription over here. They offer subscription plans for 1 month (if you want to try it out first), 3 months, and 1 year (whoa, commitment!). In case anyone is wondering, the total value of the box is Php 2,112.34. Full Disclosure: I received this box from the BDJ Box Team. I am in no way required to write a review on the box or the products, and I’m certainly not compensated to do so. My opinion on the box or the products are my own. It looks quite horrible on me! Haha. I deeply regret missing this month! 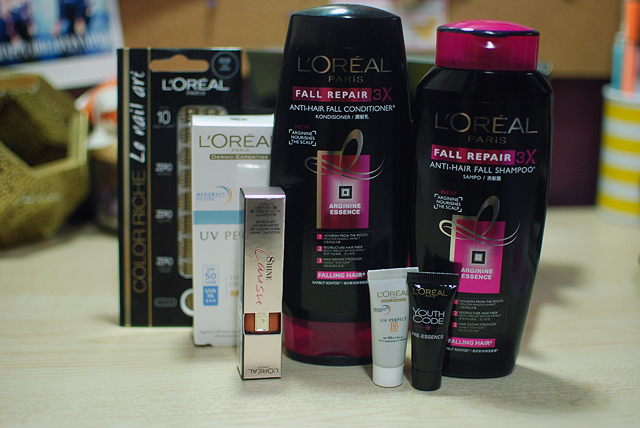 I love L’Oreal and this is just up my alley. I love the nail stickers and your shade of lip gloss. Thanks! 🙂 Sorry you missed out, though all of these products are available for purchase. 🙂 I definitely recommend the Shine Caresse!